This light summery supper is on the table in less than 30 minutes – perfect when you don’t want to spend hours in the kitchen. If you prefer, replace the salmon with pieces of cod loin or smoked haddock fillets. 1 Preheat the oven to 200°C, fan 180°C, gas mark 6. Place the salmon on a lightly oiled shallow roasting tin. Season with salt and freshly ground black pepper and drizzle over the lemon juice. 2 Place the cherry tomatoes in a bowl and add half of the oil and the garlic. Toss gently to coat. Place in the roasting tin around the salmon. Roast for 12-15 minutes until the salmon is just cooked through and the tomatoes have softened. 3 Meanwhile cook the tagliatelle in a pan of lightly salted boiling water for 8-10 minutes or according to the packet instructions. Add the asparagus tips to the pan for the final 3 minutes. Drain well. Return to the pan. 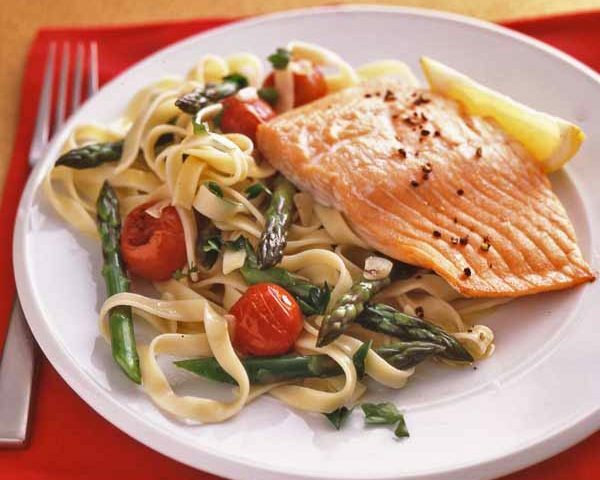 4 Add the roast cherry tomatoes and the remaining olive oil to the tagliatelle and asparagus and toss together. Season to taste with salt and freshly ground black pepper. 4 Divide the pasta between four warmed plates. Top with the roasted salmon, sprinkle with the chopped parsley and serve with the lemon wedges. You can use any long thin pasta for this dish; spaghetti or linguine would work just as well. If you use fresh pasta the cooking time will be reduced – just follow the instructions on the pack.